All across the United States, people were glued to their television sets, phones disconnected, computers turned off, friends and family ignored. All for one specific purpose--The Third Season Premiere of Buffy the Vampire Slayer. That is Mojo the Helper Monkey. He looks like a normal everyday cap and jacket-wearing monkey, but secretly he's the Slayer's number one secret weapon. Giles needs a rare book? Mojo can find it. Willow has a hard time finding a website? Mojo gives her a T3 line! Oz can't find someone to lock him up during his time of the month? Mojo has the spare chains. Cordelia can't decide that this bag matches those shoes? Mojo reads the latest fashion 'zines from France. Xander needs a clue? Mojo has *dozens* of them. Who was the one to teach Buffy about the rocket launcher? Mojo! Who was the one to stick the computer disk right where Buffy could find it? Mojo! Who was the one who told Oz who that girl was? Mojo! Who was the one who played the sappy music in the basement with Cordelia and Xander? Mojo! Who possessed Willow during the spell? Mojo! Who showed Giles where the Factory was and gave him his Flaming Ripper Bat (tm)? Mojo! Who gave Joyce the ax? Mojo! Who *really* gave Angel his one moment of happiness? MOJO! Mojo is the Slayer's servant, helper, confidante, and life-long friend. The Slayer's Handbook has been written specifically for Slayers with Mojo helping them. The Watchers do not find the Slayers, Mojo finds the Slayers. There is no greater power for good, there is only MOJO! There is no greater power for evil, there is only Mojo's evil twin JOJO! Jojo gave Angelus the keys to the school and Giles' apartment! Jojo paints Drusilla's nails and dyes Spike's hair! Jojo arranged the Incan Mummy Exhibit at the Museum! Jojo introduced the fraternity to the Reptile Boy! Jojo gave Angelus his leather pants! Jojo rented the store to Ethan! Jojo bought Buffy her bus ticket out of Sunnydale! Mojo and Jojo! Like ying and yang! Light and dark! Creamy and chunky! See Mojo and Jojo in action! Mojo and Jojo caught on camera! See what happens when other people think about Mojo and Jojo! The people who made Mojo & Jojo what they are today! 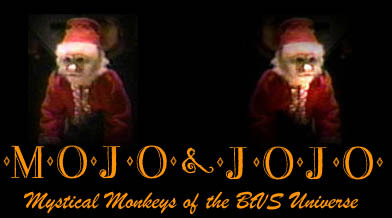 Mojo and Jojo are part of the Buffy the Vampire Slayer Universe in the same way that the Narn Bat Squad is a part of the Babylon 5 Universe. This website does not mean to infringe upon Joss Whedon's creation.